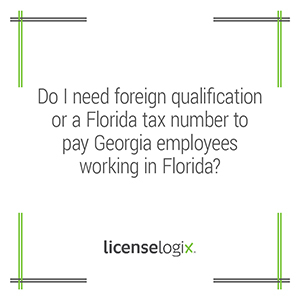 Foreign qualify or tax number to pay GA employees working in FL? In Florida, foreign corporations must "foreign qualify" or obtain a "certificate of authority" if they "transact business" in the state. The definition of "transacting business" is a legal definition and includes many different factors. Will be shipping any product from with in the state. Since you have employees living and working in Florida, you likely meet the "transacting business" threshold and will have to register with the Florida Secretary of State. Your business will also have to set up an account for withholding tax and unemployment tax. Finally, Florida imposes a corporate income tax on all corporations that conduct business, or earn or receive income in Florida. Your business will have to register for this tax with the Florida Department of Revenue and file a Florida corporate income tax return. Many Florida cities and counties impose a basic business license on any business operating in their jurisdiction. We can help you obtain all the licenses and registrations you need, as well as research any that have not been identified. For additional help you can click contact us, or give us a call at (800) 292-0909.